Last Friday, we celebrated International Women’s Day — a day of honouring womanhood and the all the strong, amazing women in our lives. 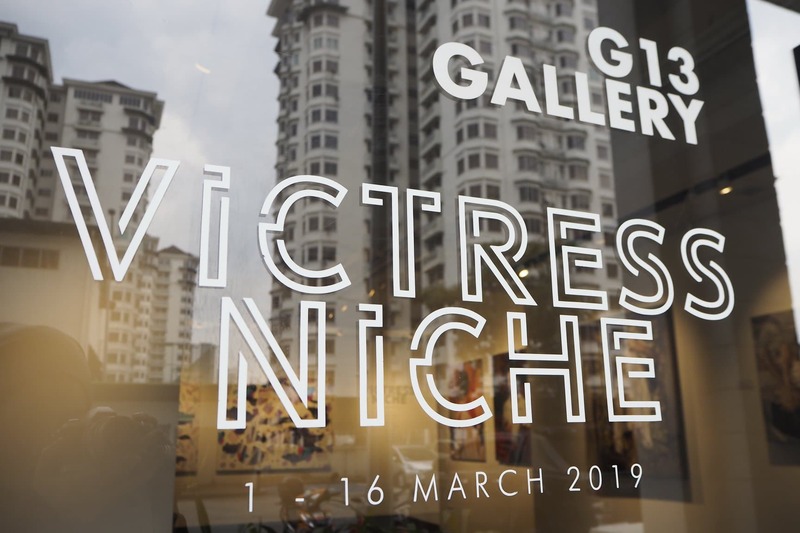 G13 Gallery pays homage to the women of art with the ‘Victress Niche’, which runs from now till 16 March 2019. 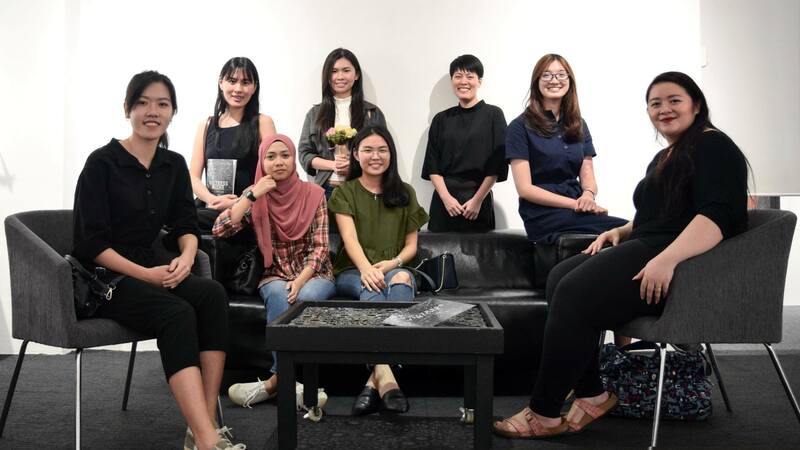 As we peruse the works of nine Malaysian female artists, Prestige Online talks to two of the artists, Alexandra Hon and Winnie Cheng, who goes by her artist alter ego Eryn. What was the inspiration behind your pieces for the show? 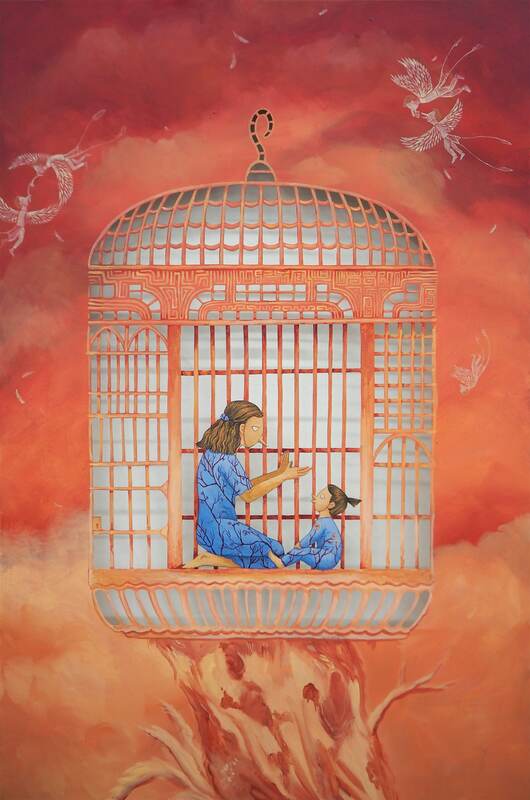 Eryn: I drew the inspiration for my pieces from my experience growing up in Southeast Asia. I focused on the ways in which our life and freedom of movement is controlled and the use of fear and security as a way to restrict what a woman can and cannot do. There is a sense of taking back the power of choice for women in these four pieces and to break free of the stereotypes that are used to label and objectify women in society. Alexandra: The sudden passing of my mother in July 2018 from what later turned out to be a rare cancer, was unbearably difficult for me to process and which left me in a dark place where it felt like there was no way out. Painting was my salvation, and I knew that the only way for me to get through my grief was to paint about it. So I decided to paint about the emotional state I was in during the first 6 days of her passing, from that fateful morning when she died, to the day we interred her ashes. 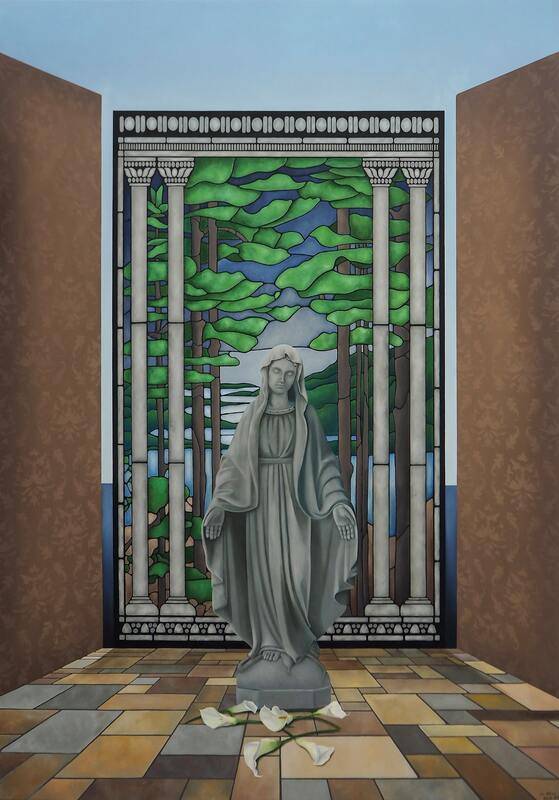 Hence, the creation of the series titled “The Difficult Crossing”; and the artworks shown in this exhibition are the conclusion to the 6-part series, and thus, signifying closure. Can you take us through your process of creating art? Eryn: I’ve previously worked with papercutting techniques to create layered drawings on paper cutouts. This time, I’ve applied the technique to a canvas support as opposed to paper. It was a way for me to reconcile my papercutting technique which has its roots in Chinese culture with the Western concept of fine art produced on a stretched canvas. The process is laborious and detailed. I strengthen the canvas by applying two layers of acrylic medium to the back before sketching the composition out. I plan each piece carefully as canvas is a flexible support and will deform and warp if I cut too much away. 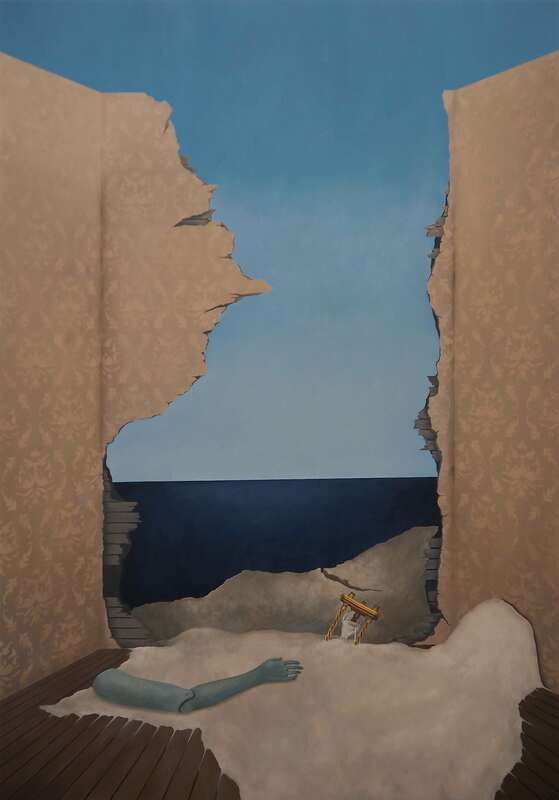 Each piece is a delicate balance between what is cut out and what remains. I do the cutting from the back before I flip the canvas around to paint in the details on the front. 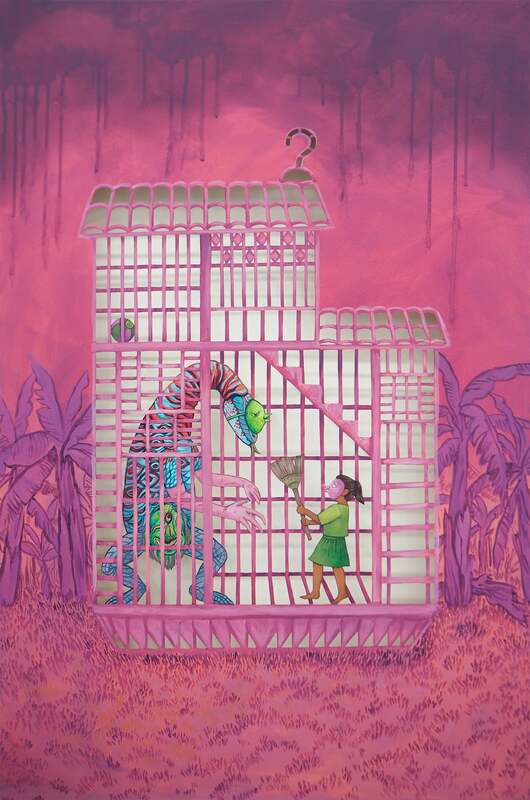 Two of the canvases also incorporate cutouts from another canvas to represent the intruders (the snake and the monster) who have snuck into the caged world. Alexandra: Most days, my routine starts around 10am and ends at 2am; and a lot of my art is introspective so a significant time in the early stages is dedicated to untangling jumbled thoughts, ideas and emotions to get to the bud I intend to nip. This is to prevent unnecessary elements from being unintentionally incorporated into the artworks which could potentially obscure the narrative. 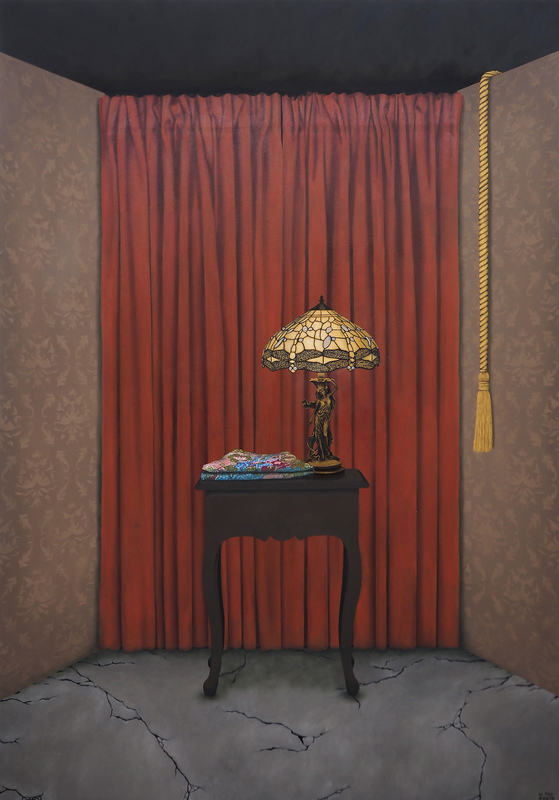 And when it comes to the actual painting, I tackle the most laborious and masochistic part first – which is painting the wallpaper patterns. That bit usually takes 2 weeks for a single artwork and my affinity for elaborate patterns currently satisfies my need to constantly challenge myself. However, it’s a little hard to explain how I come about to deciding on the painting’s ‘inhabitants’, as it’s unique to what I feel that particular painting demands. Sometimes the process requires going through personal effects, reading literature and watching various types of documentaries; and sometimes I’d come across ideas from the most unlikely places. How do you hope your audience will react? Eryn: I’m hoping that the audience can resonate emotionally with my pieces whatever stage of life or background they’re from. I hope that my work can inspire them to live their life with courage and to stand up for what they believe in. Alexandra: Honestly, I’m not hoping for any specific takeaway. Even though this series has a very personal narrative to it, not everyone knows me or know my mother. 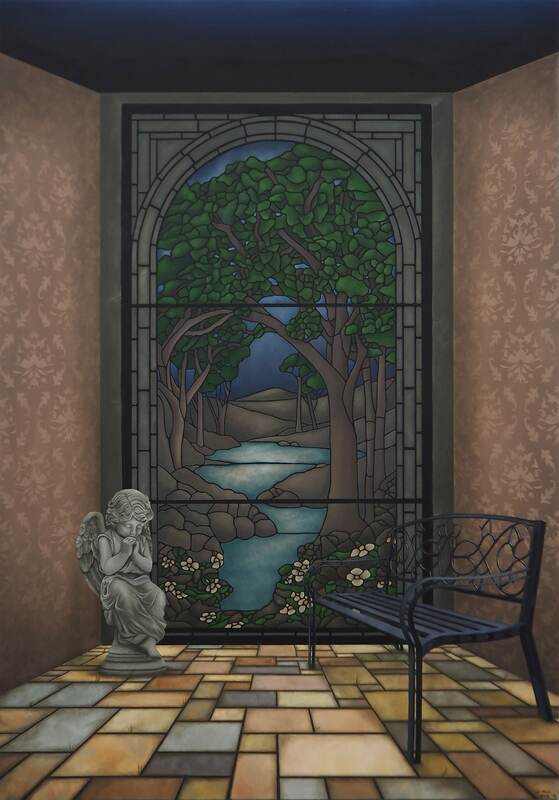 So I still like to keep my painting imagery subtle, and allow the audience to form their own interpretations and personal connections to the artworks. 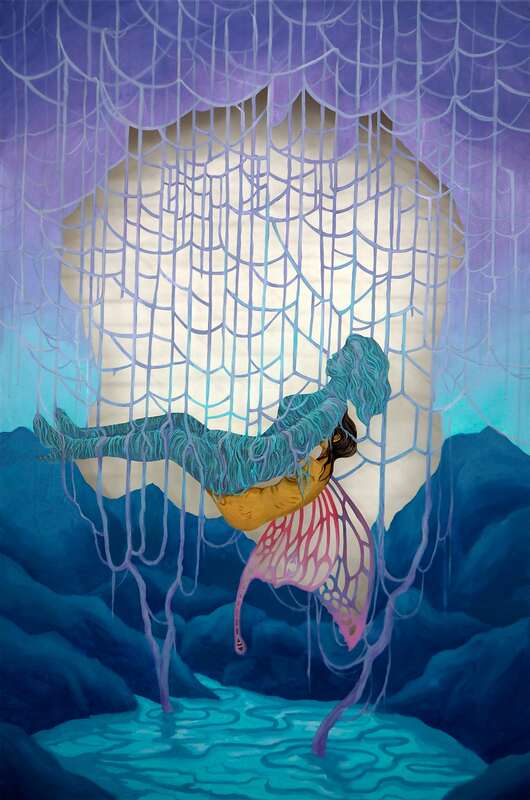 What advice do you have for other artists just starting out, particularly other women? Eryn: I chose to become an artist not because it was easy or comfortable. The road can be tough but for me, the reward of being able to express myself and create new dialogues with others more than makes up for the challenges I’ve faced. I feel that it’s important to do the research and to understand the industry as we progress as artists. Always be open to learn new things and to engage in new conversations that take us out of our comfort zone. We may face challenges as women artists and what I’ve found most helpful was to have like-minded and supportive friends who can be the light for us when we face adversity. At the same time, I aspire to be that light for others as well. Alexandra: If there’s any gender-related knowledge I’ve gained so far in my experience as an artist, it’s that to push my career and the development of my art practice beyond gender labels. I very much prefer to be considered an artist instead of a female artist and have my artwork evaluated based on its own merits without my being a woman having a significant factor. Eryn: I believe in equal opportunity for everyone regardless of their gender, ethnic background, orientation, or whatever labels society imposes on us. Alexandra: I grew up in a family where the women in my life, especially my mother, were the de facto heads of their households, because not only did they manage their homes, children and the expenses, but they excelled in their respective careers on top of all that. It’s women like them who are a source of inspiration.